As a nephrologist, I encourage patients to ask questions about their disease. Although in an encounter, it is impossible to cover all aspects of a disease or condition, successful therapy depends, not on the few moments the patient spends in the office, but on what is done the rest of the time. Understanding the needs of the patient is crucial to providing effective care. Management of a chronic disease takes engagement and immersion into a lifestyle that promotes good health. Together, the patient and doctor are sharing information that must lead to well informed decisions that can promote this engagement. This takes trust, mutual understanding and caring. We demand a great deal from the kidney patient. Take diet for instance. The kidney patient must be vigilant with respect to diet. We often discuss modifications in the intake of salt, potassium, fluids, proteins, carbohydrates, fats and sugars. It is can be quite daunting, but there are ways to create a diet that is healthy, promotes good health, and is also delicious. We also ask patients to stay away from cigarettes, get plenty of exercise, and avoid several medications while adhering to prescriptions for others. Asking questions tells the doctor one is engaged and ready to move forward with a healthy lifestyle. It also lets me fill in the gaps, so that patient can leave the office well informed. Before your visit, NEPHROQUEST will help you get introductory information you can use to engage in aa discussion with your doctor. It will help fill in the gaps, in case you remember a question you forgot to ask. NEPHROQUEST is powered by Kidney Associates, my clinical practice. Many of the questions here are often asked by my patients. If you have a question that has not been answered, just email me at fadem@kidneyassociates.com with the subject line NEPHROQUEST. Keep in mind that this site will be widely read by the public, and it will be inappropriate to include any personal information about yourself. Also, try to phrase your questions so that they will be of general interest to other readers. 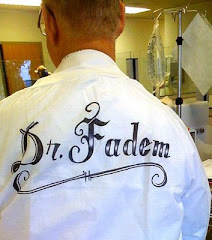 Should DOCTORS wear gowns in dialysis units?